Monday is the official start of summer! It has actually felt like summer here for a few weeks and I'm excited because this is my favorite time of year. I love this bright graffiti wall! What do you think of when you think of summer? I envision warm weather, road trips, ice cream and beaches. Fashion wise I think red, white and blue, linen, challis, gingham, floral, nautical, sundresses, maxi skirts, sunnies, floppy hats, espadrilles and sandals. With all those thoughts I was having a hard time narrowing down what to make this month, but then it hit me...What screams summer more than a flirty, white sundress? Nothing! Choosing fabric was a no-brainer because linen is basically the official fabric of summer. Besides I'd been trying to make up an excuse think of a reason to grab some of Fabric Mart's designer linen for some time now. While I love Fabric Mart for their very detailed photos of each fabric but this time it was the description just grabbed my attention. "A designer quality, 100% linen in a light-medium weight. With a plainweave, it has a natural look with thick and thin yarns typically found in linen fabrics. It has a crisp, yet soft hand and with a gentle wash, will get softer over time. It is semi-sheer when held up to the light, but does not require a lining. This is THE linen to have for all your linen garment projects." Now onto the pattern. I love dresses so I have more dress patterns than I care to admit (please don't make me count). Though I feel I can never have enough, often times too much of a good thing makes it difficult for me to select my next project. Several dresses have been on my "must make" list for a over a year but this recent addition won out. A sewsista gifted me with Simplicity 8136, which is actually a sportswear pattern consisting of a peplum top and shorts/capris. The top is what I really love, but already have a few peplum tops so I decided the top would be great a dress with a simple modification! Initially I wanted to sew up view A, the criss-cross back, but I didn't want to deal with a potential bra strap issue so I went with view B. 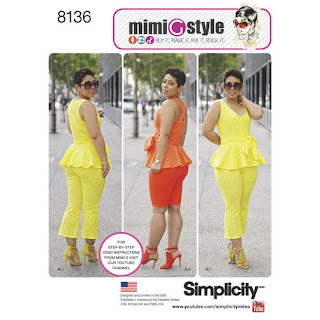 The top pattern features darts at the bust and the waist resulting in a close fit bodice. 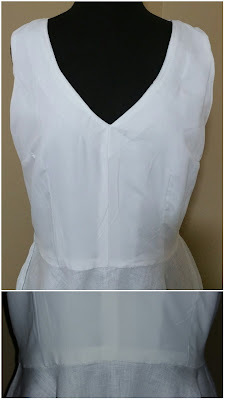 Though the description of the linen as "semi-sheer but does not require lining" is accurate, I decided to fully line the bodice for a couple of reasons. One because it was white (in a darker color this would be totally unnecessary) and two because the pattern calls for it. The bodice took a little time as there are 12 darts in total (including the lining). There was also some hand stitching the lining at the shoulders. For the skirt I added 13" to the peplum front and back piece to achieve a knee length skirt (total 23"), you could certainly add more or less based on your preference. I skipped the lining for the skirt and folded over about 1/2" twice and hemmed. Circle skirts can be tricky to hem. My favorite way to tackle this challenge is to use bias tape for a clean edge. Unfortunately I didn't have any white bias tape in my sewing room and I was to impatient to wait and buy some the next day. Though I desire for the inside of my garments to be finished they do not have to be perfect. So for the sake of time I usually baste the bottom of a bodice (fabric and lining)and attach it to the skirt as one piece and then serge for a clean finish. For this dress I chose to hand sew the bodice to the waist seam for a very clean finish. This linen is so nice I felt it deserved this treatment. This was my first time inserting a side zipper which I had avoided though I'm not sure why. It was the same process as any other invisible zipper. I did like the fact that the side zipper allowed for a smooth back. I am in love with this dress and can't wait for someone to throw an all white party so I can wear it! I could have graded out to a size larger at the waist and I still would have preferred a bias tape hem. Can you tell I love this dress?! I absolutely love this linen! It is indeed high quality and flows beautifully. So much so that I couldn't help but twirl. The only thing to note is be careful when pinning. If you have wonder clips that would be great, I don't so I just use sharp pins to prevent snagging the natural fibers. The fabric sewed up great. It does fray but not uncontrollably, I simply serged my free edges and had no issues. I see more of this linen in my future, most likely the red and avocado. If you were thinking about this ordering this linen, DO IT! Take a look at all the color options here. Beautiful! I love a white linen dress for summer and yours is just lovely. Thank you! I can't wait to see how many ways I can change it up. What a terrific dress - and you look like a million dollars in it -- great job! I love white for summer! Your dress is beautiful. It would be the perfect dress for a party with a cute high heeled sandal too! Great look! 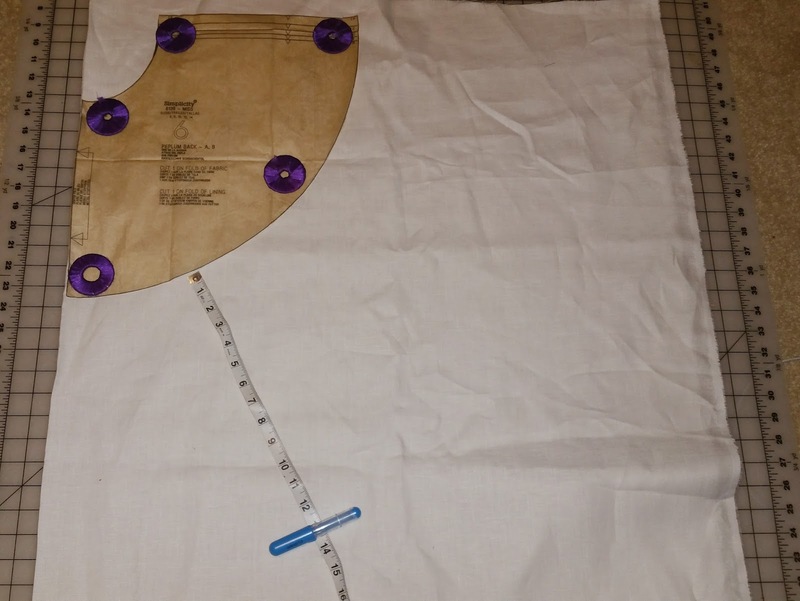 Made by a Fabricista: Tackling Your Fear Fabric!